There is no need for a Polish-English dictionary to enjoy the latest in the Polish Wings series of monographs. The switch to very readable English text and captions could not have come at a better time, given the subject matter. The author begins this volume with a discussion of the Polish government’s effort to purchase Spitfires from the UK. Interestingly, he attempts to trace the fate of the single Spitfire sent to Poland. If true, this refugee Spitfire made its way back to the RAF in Egypt, after service in the Turkish Air Force. The narrative then continues with a description of Poles serving in RAF squadrons during the Battler of Britain. Polish pilots were assigned to Spitfires during the height of the Battle, during the first week of August 1940. The bulk of the monograph focuses on the specific Polish Air Force Squadrons that operated the Spitfire Mk. I/II in combat. These squadrons were 303 Sq. ‘City of Warsaw’ (RF), 308 Sq. ‘City of Cracow’ (ZF), 306 Sq. ‘City of Torun’ (UZ) and 315 sq. ‘Deblin’ (PK). While other Polish squadrons received the Mk. 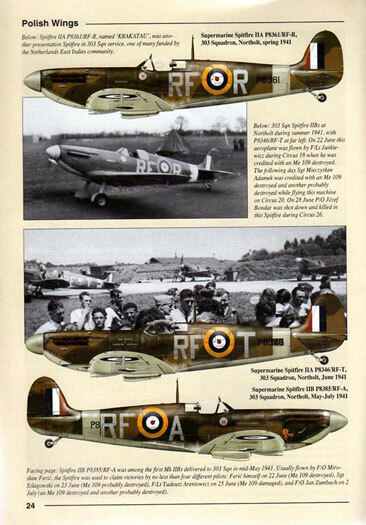 I/II Spitfire, these were used in training, not operational roles. 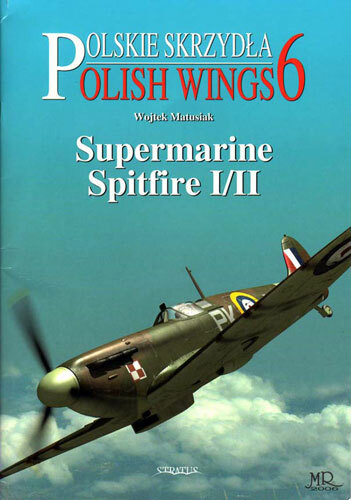 The author also notes the use of the early Spitfires by Polish pilots in other capacities. This includes Polish pilots serving in PRU’s OTU’s and Ferry Flights. Finally, if the author is correct, and it seems to be a long stretch on his part, the first Spitfire that Polish pilots flew, as part of the Polish government’s purchase commission, may have wound up as a German war trophy displayed in Cracow, Poland in 1942. As in the prior monographs in the Polish Wings series, the profiles are well integrated with photographs of the actual aircraft. The photographs also receive detailed captions, a lot more than just serial number and squadron. As for the profiles themselves, they are as good as, or perhaps even better than, those in the previous volumes. What the artist has captured quite well is the transition from the Temperate Land Scheme of Dark Green, Dark Earth and Sky to the Day Fighter Scheme of Dark Green, Ocean Gray and Medium Sea Grey. Although I cannot attest to the accuracy, the artist has presented profiles showing Temperate Land Scheme aircraft over painted in Day Fighter Scheme colors. After finishing this excellent work, what struck me most was the statement by the author that: “A total of at least 1,500 Spitfires were officially allocated to Polish units (and paid for by the Polish Government), making the Polish AF the largest ever Spitfire operator outside the RAF, and also making the Spitfire the most numerous aircraft type in the history of Polish military aviation.” A concept maybe hard to understand in that the Polish Air Force Spitfires usually wore RAF roundels.